Here is the list of the hotels near Biache-Saint-Vaast. 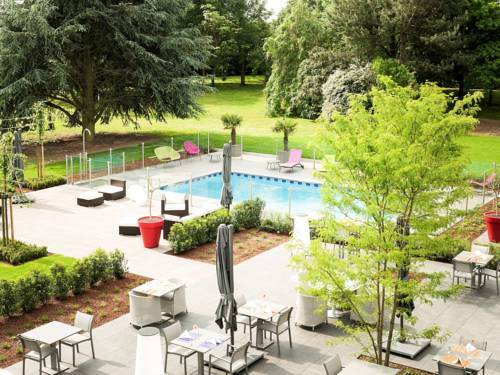 Book your hotel near Biache-Saint-Vaast today, Wednesday 15 May for the best price, reservation and cancellation free of charge thanks to our partner Booking.com, leader in on-line hotels reservation. Below here is the list the 50 closest hotels of Biache-Saint-Vaast, sortable according your criteria. You will find the position of these accommodations on the Biache-Saint-Vaast hotels map. Set on a 1-hectare park, Le Manoir de Gavrelle is located in Gavrelle and 3 km from the A1 motorway. It offers a garden, free Wi-Fi access and a restaurant that serves traditional meals. All rooms feature a flat-screen TV with satellite channels. The private bathroom is complete with free toiletries, a shower and a hairdryer. Some rooms are suitable for guests with reduced mobility. A buffet breakfast with hot drinks, pastries and jam can be enjoyed every morning at Le Manoir de Gravelle. Le Manoir de Gavrelle is 8 km from Arras and 26 km from Lens. Free private parking is available on site. La Vieille Vigne is located in Bailleul-Sir-Berthoult and is set in a renovated, former barn. This modern-style accommodation offers a terrace, a garden and exposed beams in the living room. You can drive a sport car at an additional cost. The accommodation will provide you with a TV and DVD player. You can enjoy a garden view from the room. There is an equipped kitchen with a microwave and oven. You can use the barbecue facilities on site and a restaurant can be found within 500 metres. An array of activities can be enjoyed on site or in the surroundings, including cycling. A tennis court can be found within 500 metres and sophrology treatments are available at a surcharge. This holiday home is 8 km from Arras Train Station and 32 km from Lesquin Airport. Louvre Lens Museum is 15 km away. Located in Willerval, Gîte des clés de l'Artois offers self-catering accommodation with a terrace and free WiFi. The holiday home features garden views and is 35 km from Lille. The holiday home has a flat-screen TV, a well-equipped kitchen with a dishwasher, and a bathroom with a bath and shower. Gîte des clés de l'Artois offers a barbecue. Guests can relax in the garden at the property. Arras is 9 km from the accommodation, while Tournai is 47 km from the property. The nearest airport is Lille Airport, 30 km from the property. Offering free WiFi and garden views, Les Quatre Saisons is an accommodation situated in Thélus. Guests staying at this holiday home have access to a fully equipped kitchen. The holiday home includes 3 bedrooms and a living room with a flat-screen TV and a Blu-ray player. Arras is 10 km from the holiday home. Lille Airport is 45 km from the property. Below here is the hotels map of Biache-Saint-Vaast. Names and details of Biache-Saint-Vaast hotels can be shown on the map clicking on the prices icons.